This coming Friday, the last of three national elections will take place in the small East African nation of Burundi, marking the end of a precarious and occasionally explosive election period. 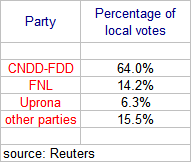 Following local elections at the end of May, which were won convincingly by the ruling NCDD-FDD party, and Presidential election on 28 June — boycotted by the opposition parties — that reaffirmed President Pierre Nkurunziza, the upcoming legislative ballot on 23 July may end up being only partially conclusive. In Burundi, which emerged in 2005 from more than a decade of armed civil conflict, every step in the electoral process has been a battle. Where previously issues were argued by the sword on the battlefield, the political stage has finally taken over as the main forum. However, extralegal political maneuvering, intimidation and sporatic violence have challenged the legitimacy of these processes, illustrating the perilous peace that exists within the country. 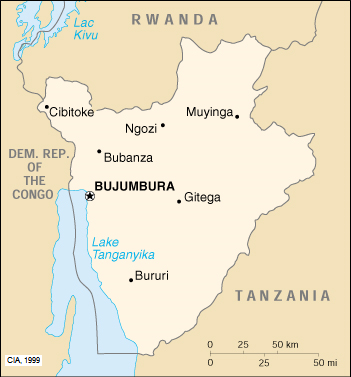 The 1993-2005 Burundi Civil War pitted Hutu paramilitary groups against the Tutsi-dominated Burundian military, after which Hutu groups began fighting with each other. The majority group in the country, making up about 85 percent of the population, the Hutus had in 1993 finally been able to get a Hutu elected President through the first democratic election since independence in 1962. Up until the 1993 election, a series of Tutsi military leaders had effectively run the country, though a series of coups, uprisings and an attempted genocide in 1972 (à la Rwanda in 1994) meant that Tutsi (about 14 percent of the population) hold on power was almost always tenuous at best. It was the assassination of this first Hutu President, Melchior Ndadaye, by Tutsi soldiers, that sparked the conflict. At the same time as internal discord tore into the social, economic and political fabric of the country (today, Burundi is one of the five poorest countries in the world), Burundi’s official military (mainly Tutsi at that time), as well as several rebel groups, took part in two massive regional conflicts known as the First (1996-1997) and Second (1998-2004) Congo Wars. 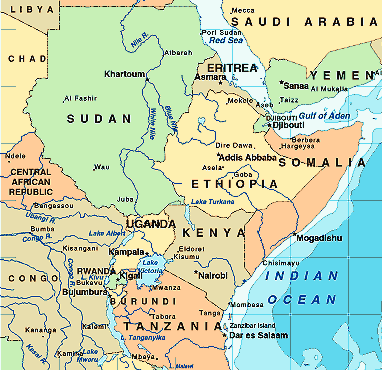 At first a relatively straightforward operation by Rwanda, Uganda, Burundi and Angola to dislodge the longtime US-backed dictator of the Democratic Republic of the Congo, Mobutu Sese Seko, the conflict quickly deteriorated into a bloodbath of fighting and displacement between armies, rebel groups, thug-like gangs, and privateers from the seven countries in the volatile region. This year’s elections in Burundi, the first full election cycle since the peace process concluded in 2005, inherits much of the pain, resentment, poverty and loss of the past 15 years. Though things have moved a long way from the worst periods of internal and external violence in the early 2000s, with committed Burundians and internationals struggling year in and year out to push peace forward, without the common enemy of a ‘Tutsi hegemony’ to united them, Hutu political and paramilitary forces have been slow to reconciliation and power-sharing among themselves. It is, however, undeniable that violence and political shenanigans remain the name of the game in Burundi, as monthly updates and periodic special articles from the well-reknown International Crisis Group have confirmed. Regardless of whether it is because they lost in the local elections and are using the well-worn tactic of discrediting the election as a way to stave off defeat, or whether more principled views dominate, the main opposition FNL (along with all others) eventually decided to boycott the presidential election of 28 June as well this Friday’s legislative ballot. The international and regional community, including a personal visit from the Secretary General of the UN have tried to mediate the dispute, encouraging a decisive and peaceful political process. At this point, however, it seems that Friday’s semi-boycotted parliamentary vote will offer more questions than it answers about Burundi’s peace consolidation process.